In my last post, I talked about what I consider to be the most fun part of the self-publishing process: designing your novel’s cover. In today’s post, I’m sharing what I consider to be the hardest part of self-publishing: writing your novel’s back cover. Now, some indie authors plan on only offering their novel as an ebook and so they might think this doesn’t apply to them since their book does not have a physical back cover. Au contraire, my friend. Even if you are offering ebooks, you still need back cover copy. The back cover copy is what you’re going to use for your book’s description on Amazon, iBooks, and other online stores. As you can see above, the back cover of my first novel, The Contenders is pretty short. 155 words. The back cover was hard to write. Really hard. Even harder since I wrote most of it before I wrote my novel. What’s that? you say. You wrote this before you wrote your novel?! Yes. You saw the title of this post. You knew this was coming. I don’t remember which writing teacher told me to write my one-page summary before writing my story–it may have been Brian McDonald, from whom I learned many of my great storytelling tips from–but it’s sound advice. If you don’t know where you’re going, how are you going to get there? Your one-page summary is the road map for your story. Without it, you’ll be lost. This gets back to the age-old plotter vs. pantser debate that so many writers like to have. I’m not a pantser. I don’t write by the seat of my pants, without an outline, and hope I get there. I am also not a plotter. I’ve tried outlining my story act by act, scene by scene; and for me, I no longer want to write the story after doing all that. All the fun and discovery is gone. I’m somewhere in between the pantser and the plotter. I don’t know what that’s called. Plotser? Pantplotter? Anyway, I digress. So, although I found it incredibly hard to do, I wrote my one-page summary before writing my novel. It helped me figure out who my main character was, what she wanted, and what obstacles stood in her way. Without knowing these essential elements, I couldn’t write my story. Did my summary stay the same the whole time I was writing my novel? No. Sometimes you can have a great map but you find out there’s a better route than the one you originally found. That’s okay. Writing is rewriting. I revised my summary throughout the time that I wrote my novel. It took me seven drafts to land on a summary that stuck. I then transformed that summary into a snappier and more concise back cover. That was my eighth draft. So, how are you going to write the back cover for your novel? First, you have to figure out who your main character is. I don’t know about you but this takes me the most time. I spend hours free-writing in a journal from my main character’s point of view until I figure out who she or he is. Next, what’s your main character’s goal? Truth be told, I’ve come up with many story ideas where I don’t know what the main character wants. Without a clear want or goal, you don’t know your main character and you don’t have a story. Figure it out! For me, I discover my character’s goal once again through free-writing from his or her point of view. Next, what is your main character’s need? This is different from the want. 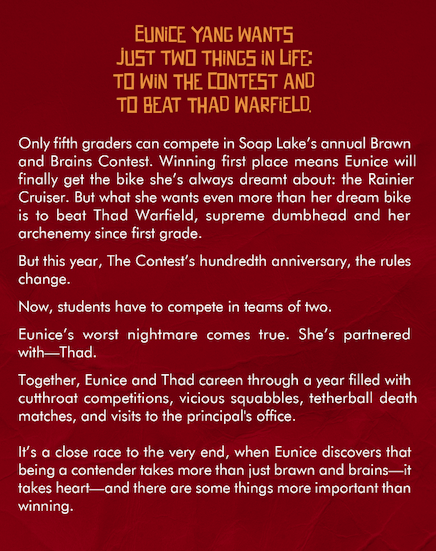 For example, in The Contenders, Eunice wants to win The Contest and beat her archenemy Thad, but what she really needs is to learn empathy. Think this is hard to figure out? You’re damn right it is. I went ’round and ’round on this with lots of free-writing and brainstorming with my husband who knows a thing or two about story. It was super hard. So, I did what most of you will do. Skip to #4. Finally, what stands in the way of your character’s goal? What is preventing your character from getting what he or she really wants? What stones can you place in your character’s path? What stones can you throw at your character throughout the story? I find this part hard but not as hard as #3. How did I figure it out? More free-writing in my journal but not in first-person. This time I started off with many “What if…?” scenarios and then wrote whatever came to mind. Some stones will be good, some not. After you have some major stones laid out, go back to #3 and work on the character’s need. Once I had an idea of these four essential elements, I then strung them together in a rough one-page summary. Don’t worry if your first draft sounds terrible. Mine sure did. Over time, you will refine it. That pile of coal will turn into a diamond after many revisions, revelations, and edits. Again, it took me eight drafts to get to my final. It’s hard work to write your back cover before you write your novel. No doubt. But if you write your back cover first, then when you are ready to publish your novel, you will have a concise summary to use for your back cover and/or your book description in online stores. Huzzah! Relief! Happiness! On the other hand, trying to write a one-page summary for your novel after it’s finished is like trying to shove a 20-foot python into a one square-foot box. Impossible to do and you end up pissed off, sweating like mad, and full of bites. Avoid that metaphorical python. Put in the hard work in the beginning and you will reap the rewards in the end. 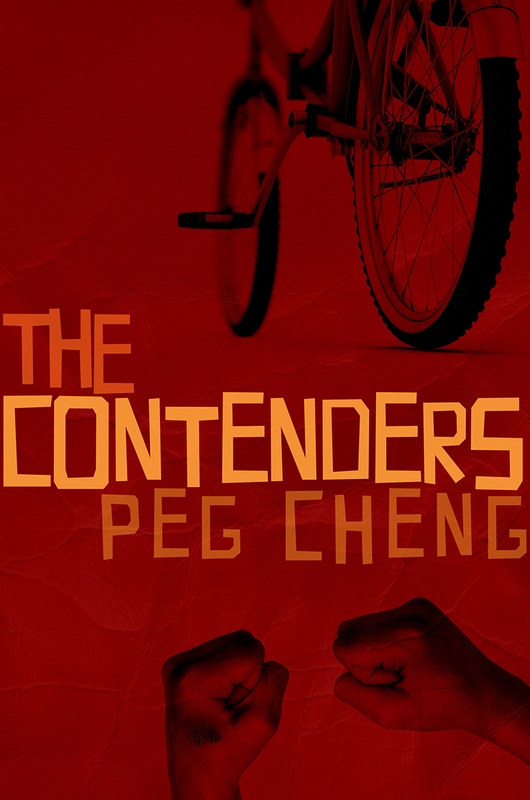 I’m so excited to show you the cover of my middle-grade novel, The Contenders! I have to say–having a cover designed for your novel has got to be the most FUN part of the self-publishing process. I mean, you get to see your novel conceptualized in different fonts, drawings, and photos. If you’re a visual person like me, it’s incredibly exciting to see a visual representation of your story. And, except for giving feedback, you don’t have to do any of the work. What could be better? Here’s how I went from nothing to awesome cover in just three weeks. First, I searched on Google for “book cover designer.” That turned up a ton of links. I must have perused about twenty different design sites before I found one that had covers that I liked and where the design fee fit my budget. I chose Kit Foster of Kit Foster Design. Second, I emailed Kit. His assistant, Robert Chazz Chute, who is also an author, got back to me quickly with a cover brief form to fill out. It only took me about an hour to complete the form and send it back, along with a sample chapter from my novel. Third, I paid half the fees in order to get started. Since I’m publishing The Contenders as both an ebook and a print book, I went for the two cover package that cost 150 British Pounds. That translates to roughly $237 US, which is a slamming good deal. It took about a week for Kit to get back to me with four different designs. It was so exciting to see them! I sent my feedback to Robert, who then passed it on to Kit. Another day or two later, Kit sends me four more designs with my suggested tweaks. This was even more exciting to receive. From this batch, I chose the winner which is the cover you see posted above. From there, Kit worked on the print cover using the back cover copy I had sent earlier. It took another week or so with back and forth feedback and tweaks, and the print cover was finished. I paid the other half of the fees at this point. To recap, I sent my initial email to Kit Foster Design on May 2nd, and my ebook and print book covers were finished by May 22nd. Thank you, Robert and Kit! I love my book cover. I also love how easy it was to work with you. So, if you’re self-publishing your novel, and want a professional cover design, check out Kit Foster Design. Hope you have as much fun with the process as I did.